WASHINGTON — Hillary Clinton brought a close to the presidential primary season with a win in the nation’s capital and a meeting with dispatched rival Bernie Sanders, hoping to set a tone of Democratic unity heading into next month’s party convention in Philadelphia. Clinton’s victory Tuesday in the District of Columbia, the final primary of 2016, had no bearing on her role as the presumptive nominee, but it nevertheless marked a transition in the lengthy primary fight between the two rivals. 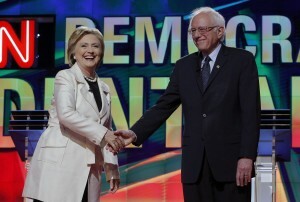 In virtually identical statements released after meeting for more than 90 minutes, the Clinton and Sanders campaigns said the two rivals discussed their primary campaign, “unifying the party and … the dangerous threat that Donald Trump poses to our nation.” Neither spoke to reporters after the session at a Washington, D.C., hotel a few blocks from the White House. Clinton told Sanders she appreciated his commitment to stopping Trump in the general election and the two discussed issues in which they share common goals, including “raising wages for working families, eliminating undisclosed money in politics and reducing the cost of college for students and their families.” Both candidates agreed to work together on the development of the platform at the upcoming Democratic National Convention. Before polls closed in Washington, where Clinton won with nearly 80 percent of the vote, Sanders vowed again to do all he can to prevent Trump, the presumptive Republican presidential nominee, from reaching the White House — but he declined to endorse Clinton. The Vermont senator had said the private meeting would help him determine how committed Clinton will be to the policy issues he has staked out during his 13-month campaign. Sanders said he would push for new leadership in the Democratic National Committee — his campaign has sparred with Rep. Debbie Wasserman Schultz, the party’s chair — along with a progressive platform in the summer convention and electoral changes, such as primaries that allow independents to participate and the elimination of superdelegates. An early test of his clout came Tuesday in Nevada, where a Sanders-backed congressional candidate, Lucy Flores, was defeated in a three-way primary.